(ACA - Paint.org) The U.S. Environmental Protection Agency (EPA) on Sept. 17 published in the Federal Register its intent to promulgate significant new use rules (SNURs) under the Toxic Substances Control Act (TSCA) for 28 chemical substances that were the subject of premanufacture notices (PMNs). The SNURs are effective on Nov. 16, 2018. 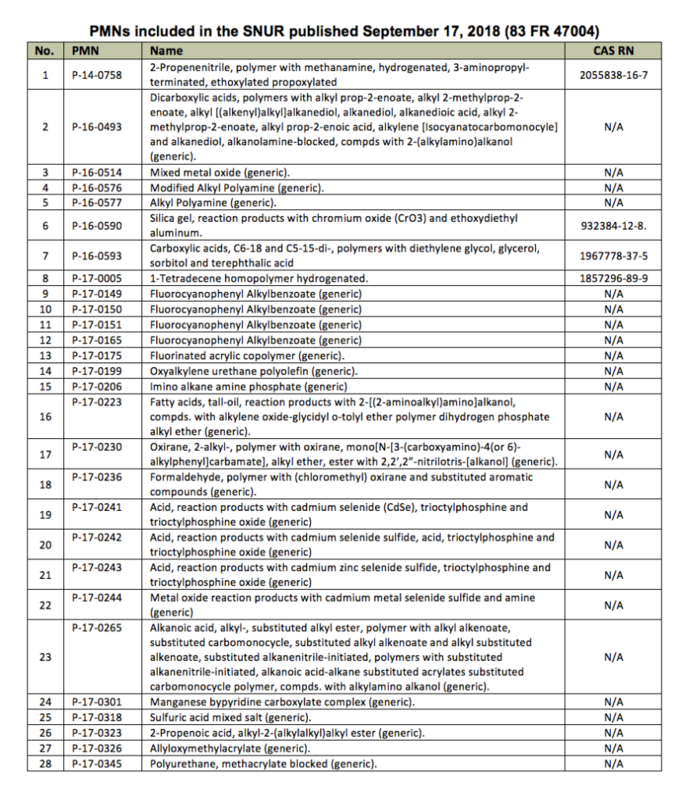 Under the amended TSCA, persons who intend to manufacture (defined by statute to include import) or process any of these 28 chemical substances for an activity that is designated as a significant new use by this rule, are required to notify EPA at least 90 days before commencing that activity. The required notification initiates EPA's evaluation of the intended use within the applicable review period. Persons may not commence manufacture or processing for the significant new use until EPA has conducted a review of the notice, made an appropriate determination on the notice, and has taken such actions as are required with that determination. The SNURs may contain restrictions on use and discharge of chemical substances, Personal Protective Equipment, and record-keeping, among other requirements. EPA is accepting comments objecting to one or more of these SNURs through Oct. 17, 2018. If EPA receives written adverse comments, on one or more of these SNURs by the deadline, the agency will withdraw the relevant sections of this direct final rule before its effective date. In effect, EPA will withdraw any SNURs subject to adverse comment from the direct final rule. EPA would then enter a separate rulemaking procedure with notice and comment about these SNURs. Notably, this process for identifying SNURS via PMNs, as EPA is currently implementing is the basis for the NRDC (Natural Resources Defense Council) withdrawing its lawsuit against EPA, late this summer. NRDC claimed procedures outlined in EPA's revised guidance for review of New Chemicals violates regulations under TSCA, to the extent EPA would issue SNURs as an outcome of the PMN review process. EPA states in guidance that it would address reasonably foreseen uses not identified by a PMN applicant by issuing a SNUR while conducting PMN review. NRDC was concerned that conflating the SNUR and PMN process into one procedure could lead to insufficient data to evaluate reasonably foreseen uses. NRDC argued that TSCA requires EPA issue a consent letter to a PMN applicant evaluating uses in the PMN application. EPA can then evaluate any reasonably foreseen uses not identified by the applicant with a SNUR, through a separate rulemaking process as necessary.